I have to admit that this was an intimidating project. I bought the wood for it at an exclusive seller in Pennsylvania for an impressive amount of money and then, being afraid of botching the job, left it to sit on the shelf for (approximately) 17 years. No scrap wood this. I had thought about what could be done with the expensive wood over the years and settled on a trestle table as the only realistic design. Then came the question of size. 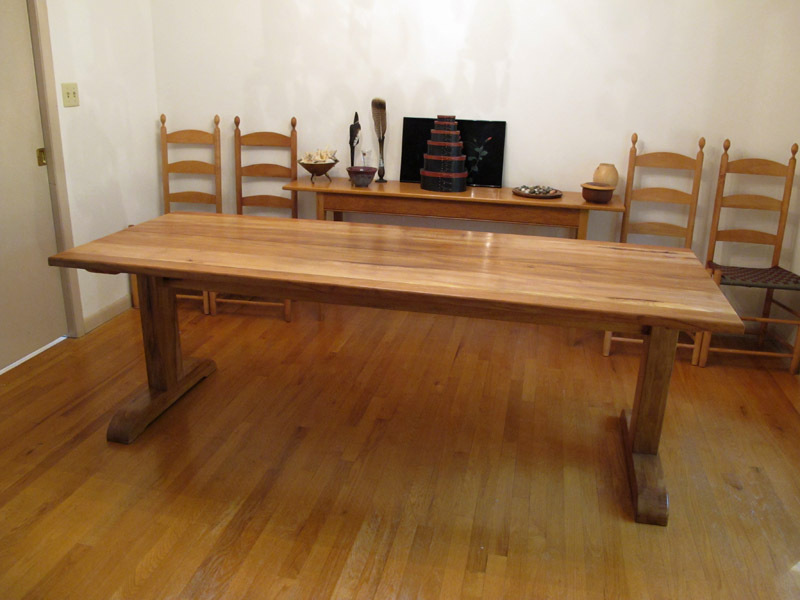 The main slabs of sycamore were so long that a table made for them would barely fit into the dining space if there was to be room to walk around the ends. I still wanted to keep in longish and finally settled on 87 inches as a decent compromise. Then came the question of width. Both slabs had a natural edge on one side and I debated making a live-edge table; then I thought about putting the natural edges in the center and leaving a "river" down the middle. Problem with that was that the table would have been fairly skinny and I wasn't sure how that would work out so I finally wound up adding stock to each outside edge bringing the width to 33 inches. Sometimes I regret that since the straight lines of the added stock jars the senses a bit and the grain match is far from perfect. Oh well, there are always compromises. I was finally able to make a serious start on the table with the assistance of Dan Duncan, a professional furniture maker and fellow member of the East Tennessee Woodworkers Guild. My shop equipment, while large by some standards was simply not up to flattening and planing the big slabs. Luckily, Dan has a serious shop and "big iron" equipment which easily handled the task. And the cost was no more than several bottles of old Shiraz from the wine cellar. Construction is simple and maybe a bit crafty too. 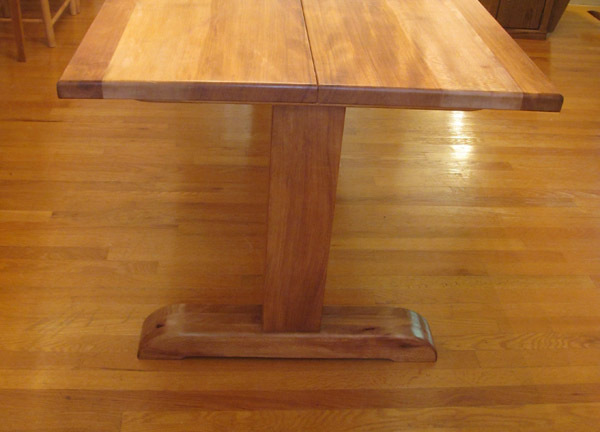 The two trestles are of simple mortise-and-tenon construction. Slightly mortised into the feet are heavy thick felt pads to prevent floor damage. The pads come with adhesive but I find that a shallow mortise for them to sit in keeps them in place better than just sticking them on when the furniture is slid. The crafty part came in with the attachment of the center stretcher which is equipped with heavy mortised-in steel bed rail fasteners. When in place the stretcher sits at the level of the trestle tops. The two slabs sit on the trestles with the inside edge resting on the stretcher. There are seven ½-inch dowels installed in the slabs to keep them aligned while allowing them to be slid apart and the slabs are fastened to the trestles and stretcher using figure-eight hardware and suitably sized screws. Done this way the whole thing can be disassembled into its constituent five parts in a few minutes. This is a good thing since the table weights 170 pounds.